The whitelist function (not to be confused with a blacklist) can be used to allow access to specified websites. For example, you may have the Kiosk homepage set as your company webpage but do not want end users tapping external links such as Facebook or Twitter. By default the whitelist is disabled. Go to Settings > Whitelist/Blacklist > tap Enable Whitelist. By default access to the Kiosk homepage is automatically granted. 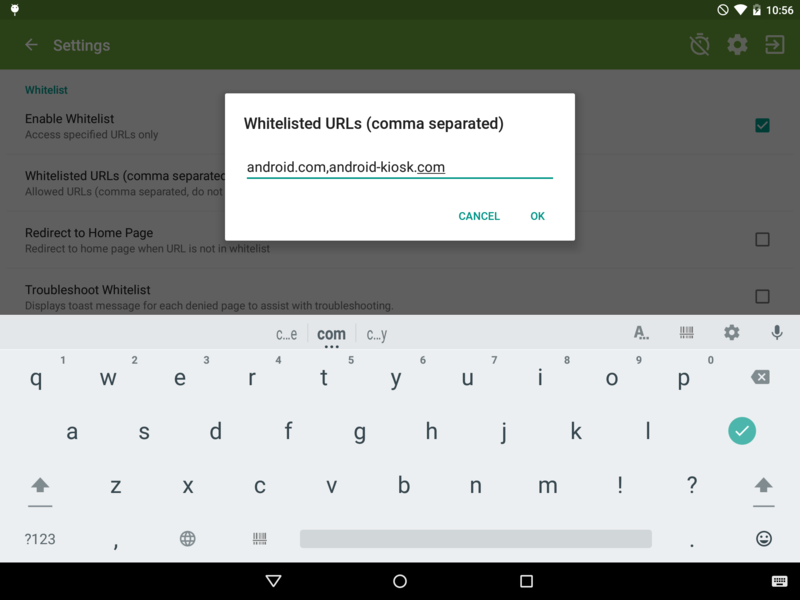 To enter allowed URLs tap Whitelisted URLs, remember to separate multiple websites with a comma. If you have entered a very specific URL it may be getting blocked because of a requirement to switch from http:// to https:// for example http://google.co.uk automatically switches to https://www.google.co.uk. So if you whitelisted http://google.co.uk you would also need to add https://www.google.co.uk or just google.co.uk would handle both. Lots of websites redirect from domain.com to m.domain.com (or similar) when viewing from a mobile device, so you need to understand how the website redirects in such scenarios. If you still can&apos;t understand which URL is blocked then turn on Troubleshoot Whitelist/Blacklist, this will display a message with the denied URL each time an attempt is made to load a page.